Kayla Matthews is a technology journalist and robotics writer whose work has appeared on InformationWeek, WIRED, RoboticsTomorrow, and Robotiq’s blog. To read more posts from Kayla, visit her blog, Productivity Bytes. Improved efficiency, collaboration features and artificial intelligence can help construction projects improve manual processes and address a labor shortage. Warehouse robots are helping humans by moving and picking items, as demands rise for e-commerce order fulfillment this holiday season. From welding to robot-assisted surgery, robot precision is a critical enabling technology. Three experts explain the importance of accuracy and precision, the rate of change, and the market prospects. 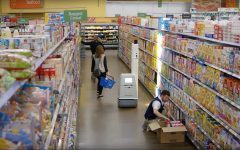 While not yet a commonplace sight, retail robots are starting to conduct many tasks to help stores manage inventory, address worker shortages, and extend operations.